Diverging widens perspective, explores new terrain and opens up options. 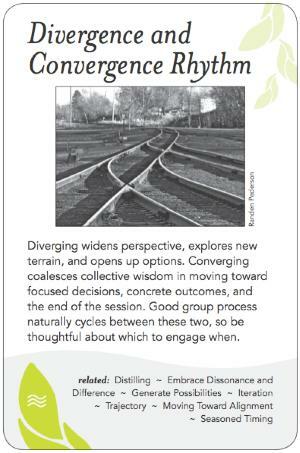 Converging coalesces collective wisdom in moving toward focused decisions, concrete outcomes, and the end of the session. Good group process naturally cycles between these two, so be thoughtful about which to engage when. In the beginning of a session, everyone comes together. From this moment forward, the group diverges so as to do its work. At a conference, people go off to concurrent sessions. At a meeting, different viewpoints are shared on a topic. At the end of a topic/meeting/event, the group rests for a moment at unity before scattering to the four directions. This is divergence and convergence, the natural back-and-forth between being one and being many. This pattern repeats at a variety of scales throughout a session. For example, in a typical business meeting, the chair arrives and lays out the agenda. On each item, there will be an initial framing, followed by exploration. Within one item, a dozen different people may speak, at which point summarizing is needed in order to establish the main threads of discussion. If one of those threads is then declared the crux of the item, a dozen people may speak again addressing various aspects of it, until the discussion narrows to having resolved that point; however, there are then still the other threads of that topic, and the other items on the agenda waiting. Thus tracking the rhythm of divergence and convergence is key to decision-making. When divergence is needed, the goal of the facilitator is to protect diverse expression, create a container that nurtures safe space for truth-telling. When convergence is needed, the goal of the facilitator is to synthesize, collect, find what's in common. A group can only tolerate so much of either--go too far in one direction, and the other will spontaneously emerge. Bring together a homogenous group, and they will immediately start surfacing differences. Gather a diverse group, and they'll search for things in common. Divergence is often less comfortable than Convergence. There is a point of the utmost Divergence, when it seems that agreement will never be reached, that Sam Kaner and his associates have memorably dubbed the "Groan Zone." Groups in the Groan Zone need reassurance that what they are experiencing is normal, to be expected, and a critical part of the process. See Embrace Dissonance and Difference for more on this. Kaner describes this as ...hitting a wall... where we struggle in the service of integration... means connecting my ideas to somebody else's, as well as letting go of my perfectly formed solutions, we enter the groan zone with a period of silence, and then the integrity of the facilitator is questioned...two things are happening: the group is assessing the trust and integrity of the facilitator ("this is a waste of time, you're taking us down a garden path, you don't know what you're doing") and people are learning, people are stretching, painful, cracking new things, Kaner warns about that as a facilitator in divergence and convergence you work with content, and in the groan zone you work on relationships, exercises that put people in other people's shoes. The need for the facilitator to stay centered, confident and "trust the process" in the midst of what might feel like a personal attack,...to use this as a clearly teachable moment to remind participants that this is a necessary part of what HAS to happen...Wise to share the model with the group, before you get there, so they are both prepared and can know that they will get through it. When someone speaks in a polarizing way (divergence), the advice from Janoff and Weisbord is, "Find that person an ally," help others relate to their experience. For example, you might ask whether anyone else has ever had an experience where they felt alienated, frustrated, etc. This mini-convergence actually supports the divergence. If a group veers too far toward convergence, group-think results, so smart leaders make sure to surround themselves with people who will actually voice opposed viewpoints, the classic gadfly role. Without this, incomplete knowledge can produce poor decisions, inappropriate actions, and paucity of imaginative possibilities. The Dynamic Facilitation method allows for greater divergence than many methods. By allowing the fullest expression of diverse viewpoints, the energy of them is naturally expended and the group arrives at irregular intervals at points of convergence more radical and therefore more satisfying than if they'd been restricted to business as usual. Facilitator's Guide to Participatory Decision-Making by Kaner, et al., chapter 1. Leading Meetings that Matter by Janoff & Weisbord, also Principle 6 (Master the Art of Subgrouping) in their book Don't Just Do Something, Stand There! Tao Te Ching, for example verses #2, 22, 29, 36.